After studying the map provided in the first pages of Treasures of the Thunder Dragon: A Portrait of Bhutan, I turned to page 1. This page contained the somewhat shocking fact that Bhutan does not use the standard GDP (gross domestic product) to measure output, but rather GNH (gross national happiness.) Needless to say, as an economics student, this piece of information sent up red flags. How do they measure happiness in villages? Is this not a very objective measure? At that point in time, I wanted to read an entire book about why the government chose this system and how it is working for them. Alas, the matter was closed by the author on page 18, leaving me with more questions and even less answers. 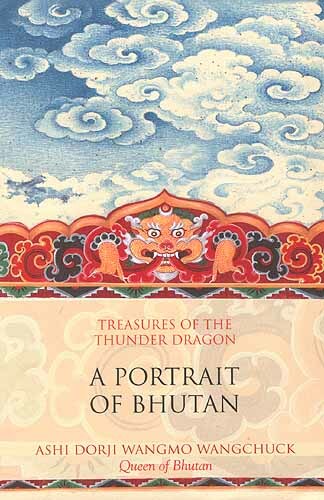 The rest of the book is a part-memoir, part-travelogue of the wife of the former king of Bhutan. The book explains her childhood, growing up in Bhutan, and her family’s rich heritage in that country. It also documents her many travels across the country as queen, most of which she attempted on foot, in order to experience the beautiful nature of this country. One of the aspects which I appreciated most was how through her family and travels, she describes the strong Buddhist tradition of this tiny land-locked kingdom. As someone with limited knowledge of this religion, I found that she describes Buddhism not only through its religious impact, but also through its importance to the Bhutanese arts, culture, and society. This being stated, I personally found the book to be quite long. I often felt like I was re-reading information, as many of her descriptions of different places seemed similar. Granted, I am someone with almost no knowledge of Bhutan, let alone its cities and religious shrines. I will note that perhaps this book is not necessarily intended for an American audience. It is published through Penguin India, perhaps for an audience that already has knowledge in this country. What did you think of the author and the author’s voice? Did you feel as if you were receiving objective information, or information with an agenda? Why or why not? After reading this book, what other questions have you developed about Bhutan? How would you describe inequality in your country? The first picture in the photo sheets shows the king on a visit to villagers in Bhutan. There seems to me to be a noticeable difference. The villages look weathered, while the king looks fresh. Is this an example of inequality or of something else? How does GNH work? Do you think it is a good system? Why or why not?